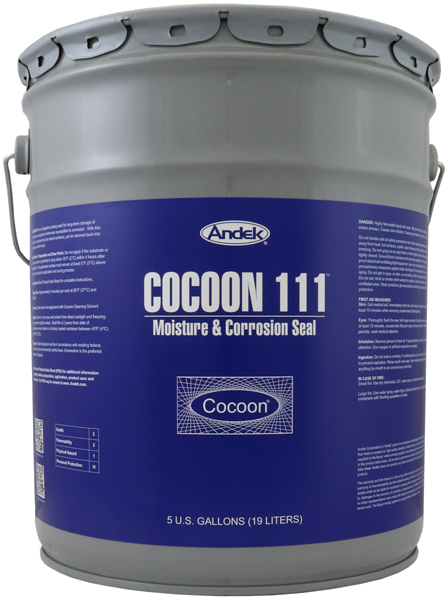 COCOON 111 is a strippable coating used for long-term storage of materials and equipment otherwise susceptible to corrosion. With this product, equipment may be stored outdoors, yet be returned back into production within hours. All surfaces must be dry, free of dirt, loose debris, oil, grease, or any substance that would contaminate or weaken the Cocoon. Close all penetrations and openings with a Cocoon webbing coat. Webbing solution is made by mixing 1 part Webbing Agent to 3 parts COCOON 111 and agitating with an air-driven mixer until it becomes a thoroughly mixed, milky white solution. Spray out the webs until a homogenous covering has been achieved. The first application of COCOON 111 over the webbing coat should be a light, rapid pass to provide the webs some strength and prevent the webs from breaking when the Cocoon coating is applied. For more information concerning the Cocoon webbing coat, please refer to the Cocoon Webbing Agent data sheet.